Hi my name is Guillermo Antony Cava Nuñez, recently while working with sweetalerts2, had to handle some Ajax requests and wanted to make use of the preconfirm methods available. It uses promises in order to wait for the response prior to advancing to the next, thus had to make a promise within the scope of the method. This drove me to refresh and pick up on promises, thus the articles that follows. A promise supports two methods: then and catch. then takes a continuation, which is just a callback that takes the result as an argument and returns a new promise or any other value. Similarly, catch is the callback that is invoked when the action raises an exception or fails in some other way. Is that surprising to you? It was a little surprising to me. The thenthunk is deferred, but the one passed to the Promise constructor isn’t. The callbacks for thenandcatch can return any value, but they behave differently if the value is a promise. Ordinarily, the return value is passed to the next then continuation in the chain. But if the return value is a promise, the promise’s fulfillment value is passed to the continuation instead. This means returning Promise.resolve(x) is the same as returning x. The function passed to the Promise constructor is executed synchronously, but any continuations sequenced with thenorcatch will be deferred until the next event loop cycle. The latter behavior is why defer works. P.S. 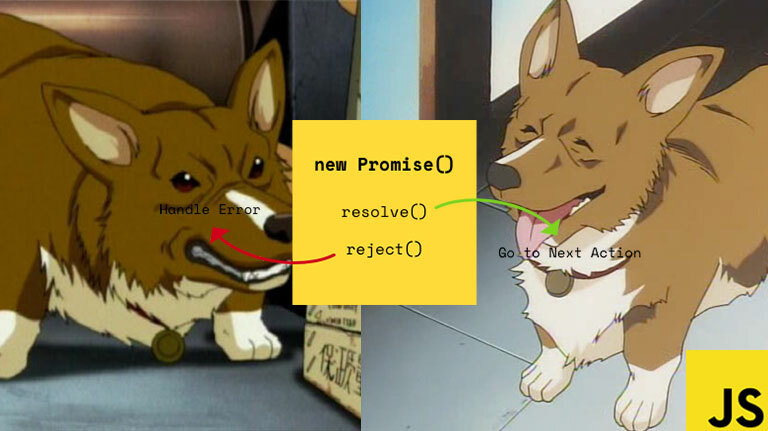 Promise is a monad! Or at least it would be, if it weren’t for surprise #1.